Most of the meter monitoring agencies send an employee a meter reader to every home, office building, municipal building, industrial plant to read the meter reading of consumption. The meter reader records the reading along with the meter picture in camera so the agency can bill the customer correctly. The company needs to manually punch the readings in a central system using reading taken by meter reading staff and the meter photos. Cellica's meter reading solution simplifies the task of meter reading and bill generation.Cellica Meter Reading Solution can be use for the monthly meter reading of GAS, Electric, Solar, Water Utilities. The organization can manage all the agencies appointed to handle the meter reading tasks. Agency supervisor can create and assign the meter reading jobs for the particular area, all the consumers within the selected area are getting considered in this reading job. List of Consumers whom readings are taken, reading remaining. Agency Supervisor can check billing statistics at any time. The supervisor can generate the billing of the reading job after validating the readings. Meter Reader Users have credentials for login. While taking readings, a user can see the consumers previous billing information to understand the actual meter reading status. 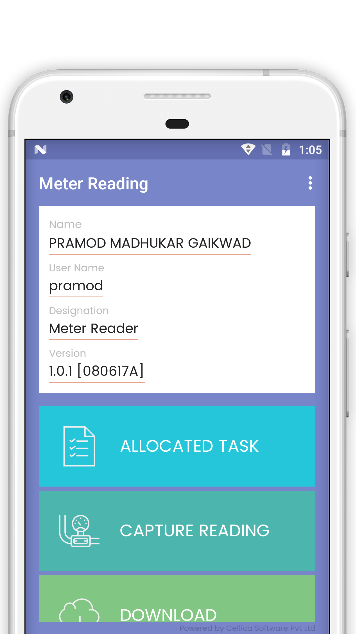 Allow working in offline meter reading mode if internet connection is not available on android device.The readings can be uploaded later once the internet connection becomes available. Category wise Billed On Average Consumer List.